List of all The Immigrants’ Civil War articles at bottom. 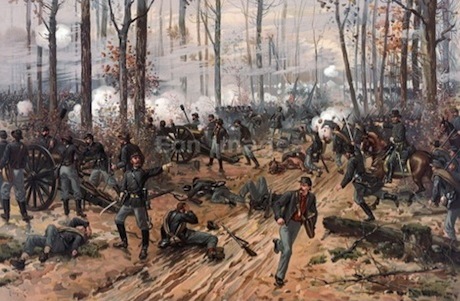 Shiloh was a confused battle in wooded countryside. Without adequate medical preparations, the wounded from both sides suffered immeasurably. The 32nd Indiana was called the 1st German Regiment by its men. The unit included many soldiers who were considered radicals even by other immigrants. Col. Willich’s political views would mark the regiment as unique. The terrible carnage at Shiloh gave rise to this jaunty Southern song. August Willich’s Gallant Dutchmen: Civil War Letters from the 32nd Indiana Infantry, translated by Joseph Reinhart, Kent State University Press (2006), is the principal source for this article. Joe Reinhart has translated several volumes of immigrant soldiers’ letters and diaries. I would say he has given a voice to the voiceless, but these men could speak for themselves. Joe has really given the rest of us ears so we can hear what they had to say. PBS has created a simulation in which you can explore Union General U.S.Grant’s decision-making during the battle. 1. August Willich’s Gallant Dutchmen: Civil War Letters from the 32nd Indiana Infantry, translated by Joseph Reinhart, Kent State University Press (2006) p. 75; Shiloh and the Western Campaign of 1862 by O. Edward Cunningham, Savas Beatie (2007) pp. 360-361; Memoirs of General William T. Sherman published by De Capo (1984) pp. 222-247; “The Battle of Shiloh” by U.S. Grant in Battles and Leaders of the Civil War Vol. 1 pp. 465-486; “Shiloh Reviewed” by Don Carlos Buell in Battles and Leaders of the Civil War Vol. 1 pp. 487-536; “The Campaign of Shiloh” in Battles and Leaders of the Civil War Vol. 1 pp.569-593. 3. August Willich’s Gallant Dutchmen: Civil War Letters from the 32nd Indiana Infantry, translated by Joseph Reinhart, Kent State University Press (2006) p. 59. 4. August Willich’s Gallant Dutchmen: Civil War Letters from the 32nd Indiana Infantry, translated by Joseph Reinhart, Kent State University Press (2006) p. 60. 5. August Willich’s Gallant Dutchmen: Civil War Letters from the 32nd Indiana Infantry, translated by Joseph Reinhart, Kent State University Press (2006) p. 31. 6. August Willich’s Gallant Dutchmen: Civil War Letters from the 32nd Indiana Infantry, translated by Joseph Reinhart, Kent State University Press (2006) p. 13, 30. 7. August Willich’s Gallant Dutchmen: Civil War Letters from the 32nd Indiana Infantry, translated by Joseph Reinhart, Kent State University Press (2006) p. 19. 8. August Willich’s Gallant Dutchmen: Civil War Letters from the 32nd Indiana Infantry, translated by Joseph Reinhart, Kent State University Press (2006) p. 71, 75. 69. The Irish Brigade Moves Towards Its Destruction At Fredericksburg.